With Baby L learning to walk and always on the move when we heard about The Juppy Baby Walker I was intrigued. The Juppy is a portable walker you can take anywhere, it is a new way to assist your baby in walking without all of the back pain. It sounded interesting to me so I was willing to try it. When we first put Baby L in the Juppy he was pretty excited, wondering what we were up to and why we were so excited. 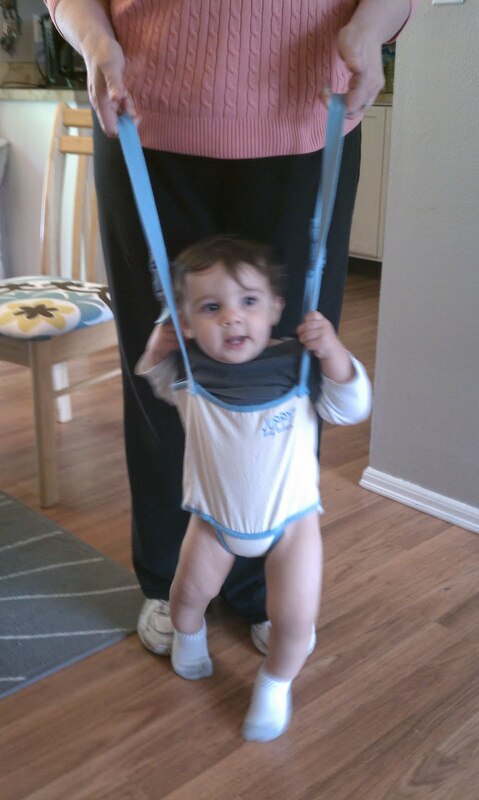 We zipped him up, adjusted the straps and started to walk. For some reason Baby L thought that he was in a jumper or something because he stated to jump up and down and would not quit! I had a hard time holding up the straps because he was bearing all of his weight on me. After a while we got the hang of it and he was attempting to walk, after wearing himself out from jumping! I think that it would have been great for my husband or someone with more arm strength, who could withstand all of the weight of a almost 1 year old. I like the idea of this walking tool but, I am a little old school so adapting to this new device was a little strange to me but I could see some parents really benefiting from the Juppy Baby Walker. I could also see in the short time we tried it out that he was growing confidence in his ability to "walk" on his own. 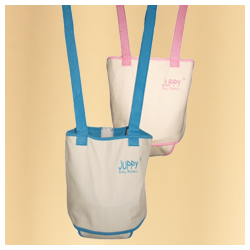 The Juppy® Baby Walker is a doctor recommended training aid for teaching your baby how to walk while saving the strain and stress on your back. Let me know what color you would want! *Limited to US residents; 18 years old and above. Giveaway starts June 10, 2011 and ends on June 25, 2011 at midnight PST. Winner will be emailed and has 48 hours to respond before another winner is selected. I was not paid for this giveaway or post. I was provided for free the product mentioned for this review. The opinions are 100% mine and may vary from others. i have a baby girl so i want pink! I would love a blue one for my son! He's already starting to show signs of walking at 6 months! I would love this in pink. I "liked" juppy baby walker on facebook. I "liked" frugal family tree on facebook. I would love a blue one :)! I would want the blue!